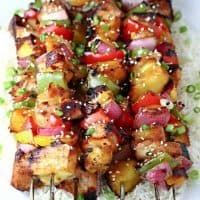 GRILLED SESAME CHICKEN KABOBS — Tender chunks of chicken are grilled on skewers with peppers and pineapple, and basted with a sweet and spicy glaze. 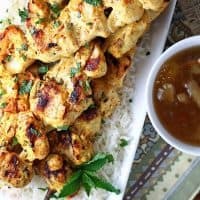 We first started making these Grilled Sesame Chicken Kabobs years ago, when my then 12 year-old saw a similar recipe and requested to help make them for dinner. 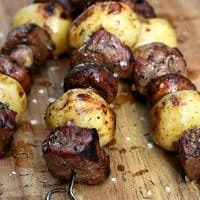 He’s 18 now, and these kabobs are still a favorite meal, especially in the summer, so I figured I should share the recipe with you! We still love these as much as the first time we tried them. 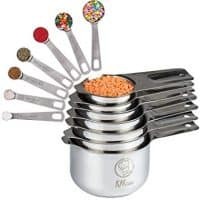 First of all, there’s something about a kabob that’s just fun. And with all the wonderful colors and flavors in these kabobs, this is a meal that’s really hard to beat. Not only does my entire family love this meal, it’s quick and easy to make, and it’s healthy too. With a side of rice, it’s a complete meal that you can feel good about serving your family any night of the week. My favorite is the pineapple–actually, I think it might be everyone’s favorite, so I usually add extra. And you could easily use chunks of beef, or even shrimp, in place of the chicken. The baste and marinating liquid for these kabobs is a sweet and savory blend of apricot preserves, soy sauce and spices that goes perfectly with both the meat and vegetables. Don’t worry if you forget to marinade the chicken–even if you miss that step, these kabobs still turn out delicious. Believe me, I speak from experience! And yes, the glaze is delicious on the pineapple too! I like to finish everything off with a sprinkling of green onions and sesame seeds, for a bit of added color and texture. You really must try these sesame chicken kabobs as soon as possible. 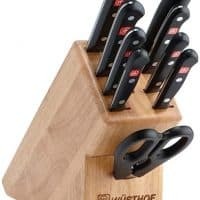 I think you’ll love them as much as we do, and I hope they become a favorite meal at your house too! 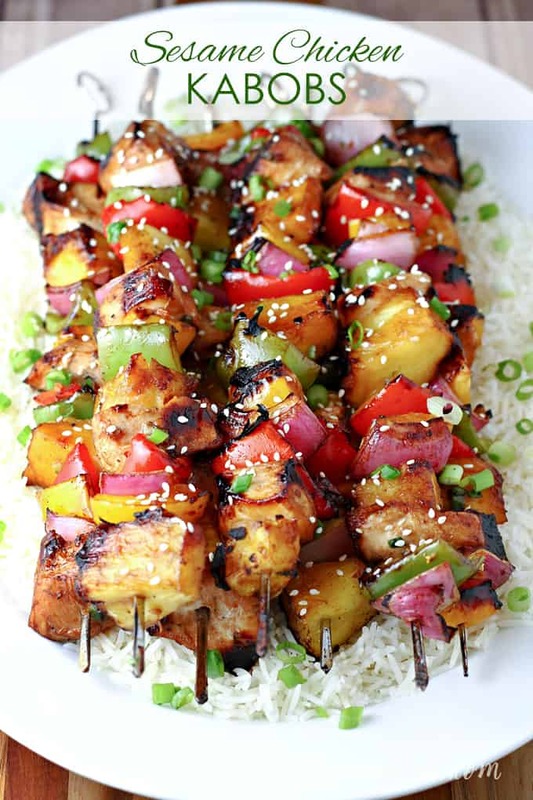 Be sure to save this recipe for Grilled Sesame Chicken Kabobs to your favorite Pinterest board for later. Tender chunks of chicken are grilled on skewers with peppers and pineapple, and basted with a sweet and spicy glaze. In a large bowl, combine the broth, soy sauce, onions, preserves, oil, garlic, ginger, hot pepper sauce and 1-teaspoon sesame seeds. Pour 1/3 cup into another bowl for basting; cover and refrigerate. Pour remaining marinade into a large resealable plastic bag; add chicken. Seal bag and turn to coat; refrigerate for 2-3 hours or overnight, turning occasionally. Drain and discard marinade from chicken. 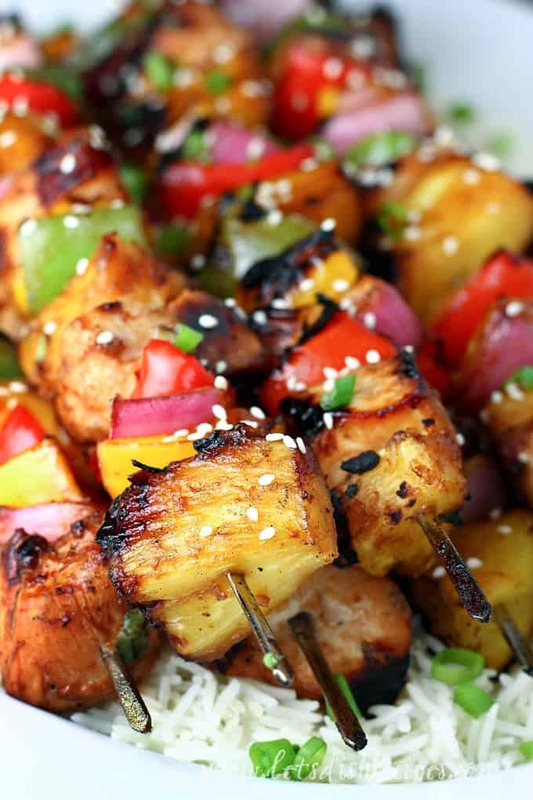 On metal or soaked wooden skewers, thread chicken, peppers, onion and pineapple. Grill, uncovered, over medium heat for 6 minutes, basting with reserved marinade. Grill 5-10 minutes longer or until meat juices run clear, turning and basting frequently. Sprinkle with remaining sesame seeds and serve. Juicy steak, tender potatoes and savory mushrooms are skewered and grilled to perfection! 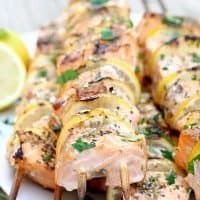 Salmon is skewered with lemon slices, then coated in a savory spice mix and grilled to perfection. Chicken is marinated in Greek yogurt and tandoori spices, then skewered and grilled to perfection in this simple, east to make meal. 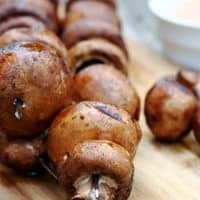 Fresh mushrooms are marinated in balsamic vinaigrette, then skewered and grilled to perfection and served with a steak sauce infused mayonnaise for dipping. Who Dished It Up First: Adapted from Taste of Home’s Celebrations Cookbook.